Finally, your app is uploaded to the App Store Connect, you have the latest build processed and you are uploading images — the last step before Submitting for Review. You need some 40 images and there is no time to lose processing them. Images can’t conatain alpha channels and transparencies. So how do you remove alpha channels and transparencies from the images you want to upload to the App Store? The standard app Preview used to have ability to bulk read images and save them without alpha channel. Not any more. You can use GIMP or similar “simple and manual” piece of software to remove alpha channel one by one image, 40 times in a row. If you have it, you can use PhotoShop and make a macro. That will solve the problem but you have to have it first. There must be a better way and it is called Alpha-Channel-Remover on GitHub by bpolat. I downloaded the source code, ran it through Xcode 10.2 and Voila!, the MacOS app came running. I then copied five files from the folder I gathered the images from the simulator and it showed there were 5 images in it. 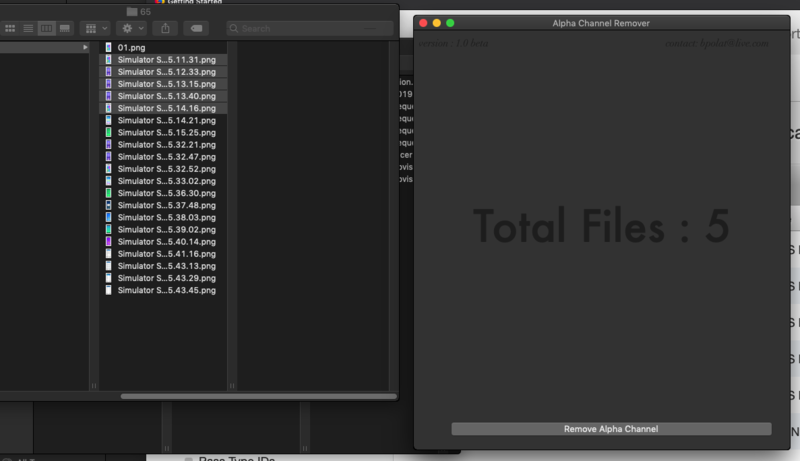 Clicking on button Remove Alpha Channel will do exactly you expect it to do: the files will be overwritten with a new version but without alpha channels in it. And these files will upload without problems to the App Store. Win – win – win and many thanks to bpolat!